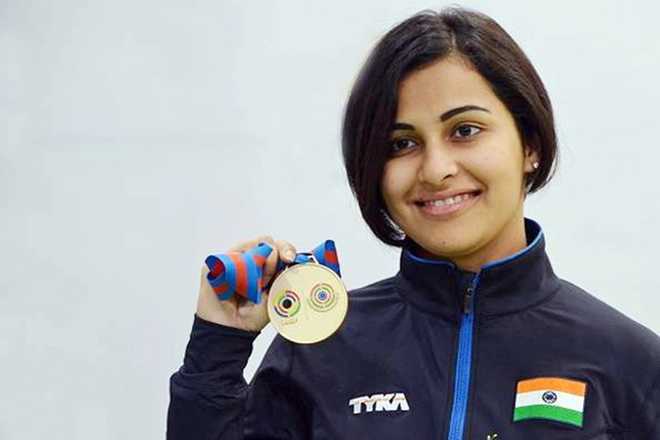 Heena Sidhu picked up India’s third gold medal in shooting by finishing on top in the women’s 25m pistol event in the Common Wealth Games being held in Australia. By breaking the CWG record in the process in Gold Coast, Sidhu shot a final score of 38, two of them perfect fives, to claim the top honours ahead of Australia’s Elena Galiabovitch. Image : Heena Sidhu after receiving the Gold medal in the women’s 25m pistol event. This is her second medal at this game after having claimed the silver in the 10m air pistol event behind 16-year-old compatriot Manu Bhaker. Indian shooting ace Jitu Rai claimed the gold medal in the men’s 10m air pistol event by creating a new games record while compatriot Om Prakash Mitharval bagged a bronze at the 21st Commonwealth Games on Monday. Image : Jithu Rai after receiving the Gold medal in the men’s 10m air pistol event. Image : Om Prakash Mitharval after recieving the medal. Earlier, defending silver-medallist Gagan Narang signed off a disappointing seventh while debutant Chain Singh finished fourth in the 50m rifle prone event at the Belmont Shooting Centre. Narang, who qualified third for the final with a score of 619.4, went out after the first stage of elimination.